Accessing a Mac’s rear-facing ports can be a hassle, particularly when you’re using short cables. To eliminate that issue, Moshi’s original iLynx combined four USB 2.0 and two FireWire 400 ports into a triangular hub designed primarily to sit in front of an iMac. Later, a cosmetically near-identical sequel called iLynx 800 modestly updated the accessory by updating the ports to FireWire 800. With FireWire dead and USB 3.0 growing in popularity, there’s a new iLynx in town. iLynx 3 ($60) drops FireWire entirely in favor of an all-USB approach, relying on a combination of USB and wall power to connect up to four devices to your Mac. Read on for the details. Measures 4″ by 2.2″ by 1″ thick at maximum, tapering down to 0.8″ at back. Quite portable. Matches all silver aluminum Macs with black accents. Does away with FireWire ports that had compatability issues in prior iLynx models. 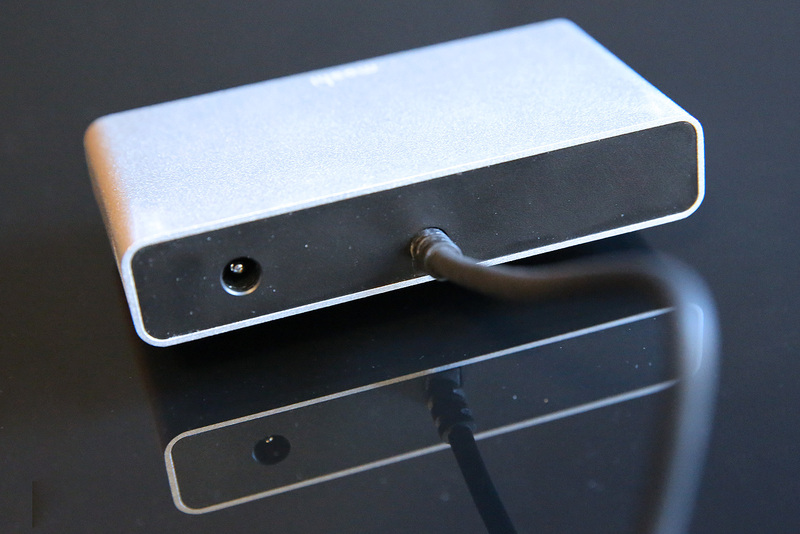 Design looks like card readers made by others, but very nice for a USB 3.0 hub. Still made primarily from silver aluminum, iLynx 3 drops the triangular shape for a more conventional rounded rectangular box with black plastic on the front, back, and bottom. Moshi has given the front metal edges and plastic face a glossy polish, while the back is matte, flat, and plain. A permanently attached rear USB 3.0 cable attaches to your Mac, and an included detachable wall power adapter can be kept with iLynx 3 or left at home when it’s carried around. Like its predecessors, iLynx 3 was made to rest on the downtapered central leg of an iMac, which is why its rubber bottom has an inverse slope. Placed on the iMac’s leg, iLynx 3’s ports point forward rather than facing slightly downward; on a completely flat surface, the ports tilt gently upwards. 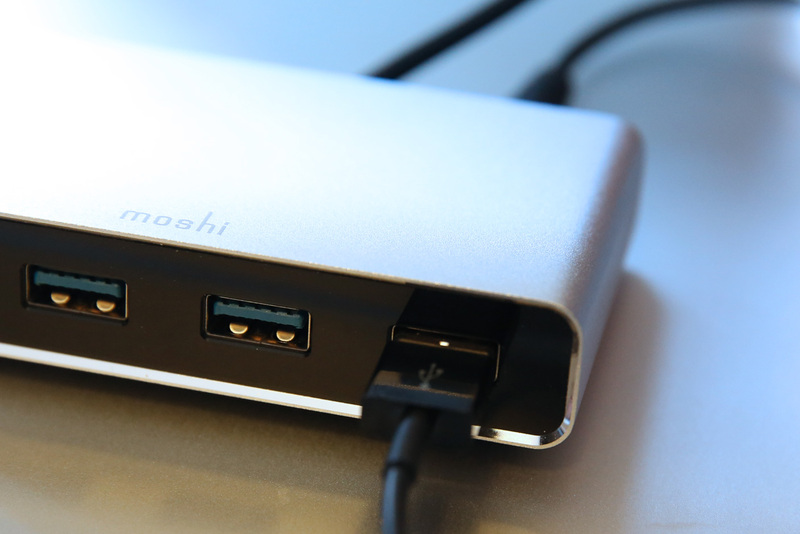 In any case, the ports are always easy to access — much easier than reaching around to the back of a Mac. 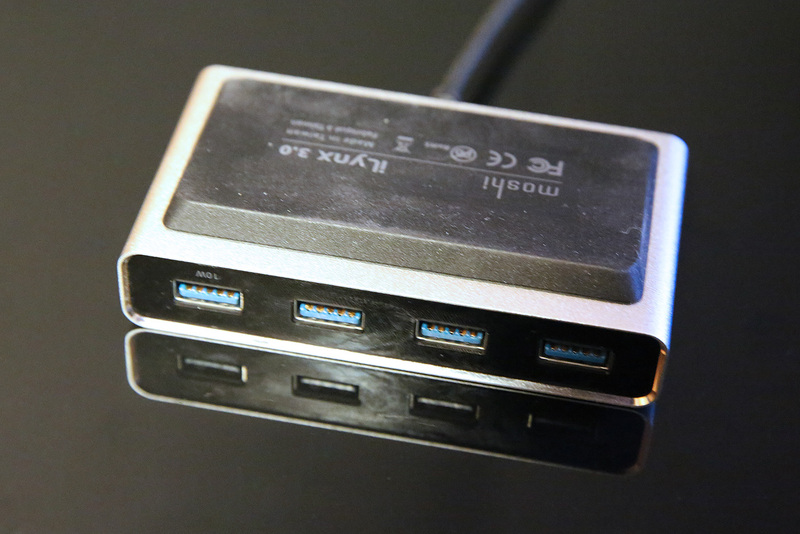 As with many of the Macs it connects to, iLynx 3’s four front-facing ports are all USB 3.0, supporting a transfer rate of up to 5Gbps. The real-world speed will obviously depend on the number of devices you keep connected to the hub, as well as the number of USB devices already connected to your Mac. 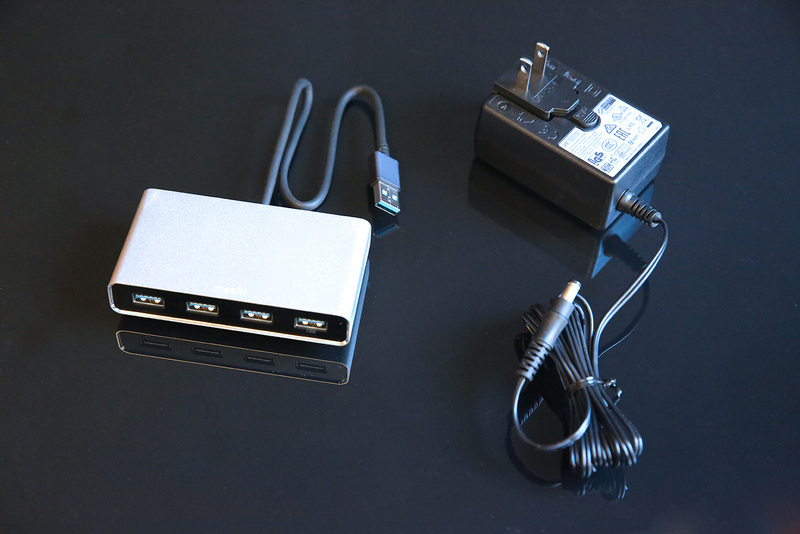 Powering the hub can be an issue if you’re not careful, particularly with pre-USB 3.0 machines. Although the hub alone can maintain a 900mAh power level when connected to a USB 3.0 computer, a pre-USB 3.0 iMac turned its USB bus off when iLynx 3 was attached without the power adapter, complaining of excess power drainage. 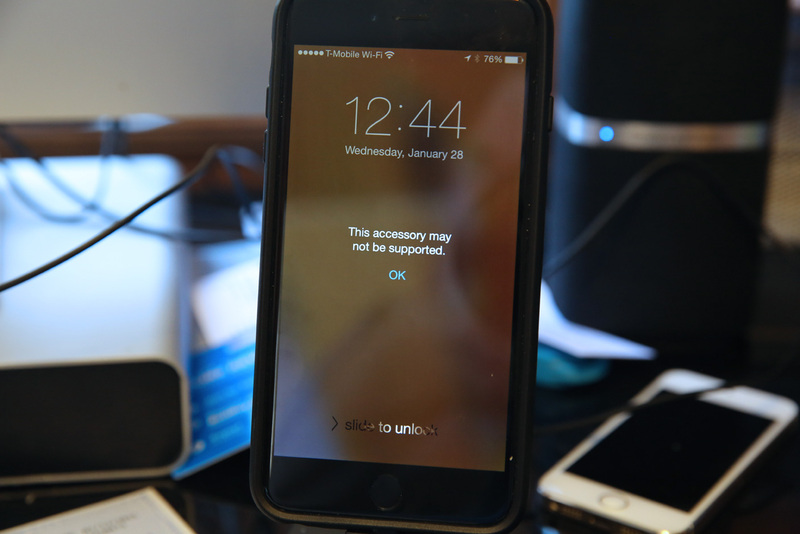 The same computer brought up a “This accessory may not be supported” message when an iPhone 6 Plus was connected to an adapter-less iLynx. So while Moshi enables you to use iLynx 3 solely with its own USB plug, you’ll probably want to keep the adapter around. The wall adapter guarantees a 10W/2.1-Amp power flow at all times to the fourth USB port, which is very subtly marked with “10W” to indicate that it’s different from the other USB connectors. I had no trouble charging the latest iPads and iPhones using this port, even when the connected computer was turned off, nor did I have any issues synchronizing or using devices when the computer was on. The single biggest challenge iLynx will face is price competition. Rivals such as Anker are now selling aluminum four-port USB hubs for $40 MSRPs — currently only $17 at Amazon — and Amazon itself offers a plastic $19 AmazonBasics model with a wall adapter, noting that it “is not intended to charge iPads/tablets.” Apart from the fact that you’re not getting both a metal body and a power adapter in the same accessory, a common complaint about these budget hubs is inadequate power for certain accessories. iLynx 3 is a viable solution. It isn’t cheap, but between its 2.1-Amp port, nicely-designed chassis and included adapter, it does what it’s supposed to do and looks really nice doing it.